According to ancient Egyptian mythology, Nut (pronounced “newt”) is the goddess of the sky and heavens. She was the daughter of Shu, god of vital breath, and his wife Tefnut, goddess of heat. She was usually depicted as a woman bent over Earth with her head in the West and feet in the East. She was sometimes depicted as a celestial cow. She was part of the cosmogony (a theory of the origin of the universe) of Heliopolis. The ancient Egyptians believed that she protected the Earth deity Geb, her husband, from the night sky. Myths also state that the sun deity Ra traveled through her - she swallowed him at night and then gave birth to him every morning. Ra was then replaced by Thoth at night. She was often associated with coffins and sarcophagi because she protected the dead until they were reborn in the Afterlife. Nut became pregnant with five children and Ra forbade her from giving birth during the official calendar year. The ancient Egyptian calendar consisted of only 360 days in a year, had twelve months of thirty days and twenty-four hours within those days. She asked for help from Thoth, god of the moon, scriptures, sciences, messenger and recorder of the deities, master of knowledge, and patron of scribes. It has been said that Thoth was secretly in love with Nut and didn’t hesitate when she asked for his assistance. Thoth was able to play dice with the moon and granted Nut five extra calendar days in order for her to give birth to the five children: Osiris, Isis, Seth, Nephthys, and Horus the Elder. These children were not welcomed and were considered intruders in the divine community. 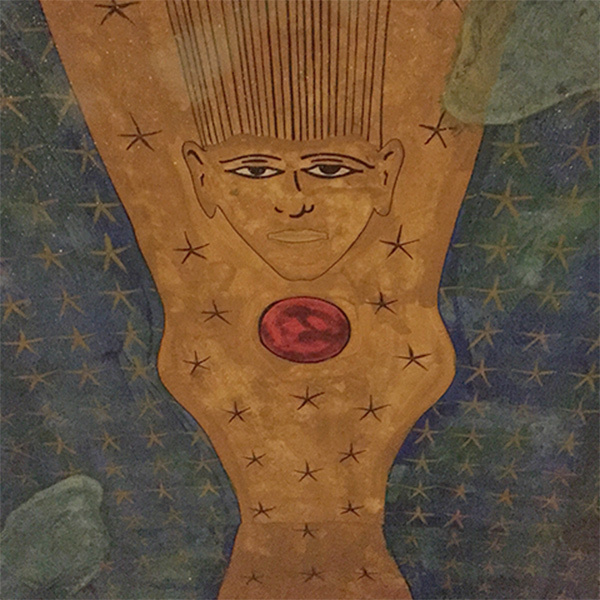 Image: Nut on the ceiling of the underground tomb in the Rosicrucian Egyptian Museum.